Oracle announced this week that the company's comprehensive suite of enterprise applications for businesses will be heading to the cloud, and to celebrate, Larry Ellison joined the more than 600 million people using Twitter. His first tweet? Why, a jab at competitor SAP, of course. 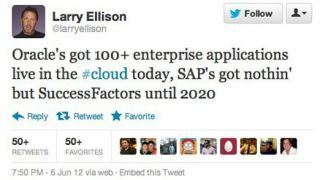 "Oracle's got 100+ enterprise applications live in the #cloud today," Ellison wrote in his Twitter debut. "SAP's got nothin' but SuccessFactors until 2020." Oracle spokespeople confirmed that the Twitter account aptly known as @larryellison does indeed belong to Ellison. But whether it's being run by the man himself or an assistant, that certainly sounds like something he'd say. And the message has not fallen on deaf ears - in two days, Ellison's amassed more than 25,000 followers. The number jumped by 25 in the last hour. And that's with only one tweet. "The most comprehensive Cloud on Earth"
Oracle's cloud strategy involves plenty of boasting, as the press release sent out earlier this week credits Ellison as saying, "We are now announcing the most comprehensive Cloud on the planet Earth." "Most cloud vendors only have niche assets," Ellison continued. "They don't have platforms to extend. Oracle is the only vendor that offers a complete suite of modern, socially-enabled applications, all based on a standards-based platform." Oracle's cloud services focus on platform building (database, Java, web, mobile applications, etc. ), application services (financials, human resources, recruiting, sales and marketing, customer service) and social networking and analyzation of social services. The Oracle cloud platform is meant to be a totally comprehensive suite of tools and applications to enable business "to speed time to market and lower costs," according to the press release. Like any good cloud, Oracle's will enable customers to move seamlessly between desktop and mobile apps. "Larry's crystal ball is cloudy"
Ellison's signature confidence seems unshaken by Oracle's recent legal problems, including a potentially devastating loss in a copyright case against Google, and allegations from HP that Oracle owes billions for a breach of contract. But SAP said in a statement that Ellison's taunt reveals his insecurity. "As usual, you can tell who Oracle is most worried about by the competitors they criticize most. In this case, Larry's crystal ball is cloudy," the statement said. "SAP's strategy offers customers a long-term road map of innovation without disruption. "Oracle customers face a difficult upgrade challenge with Fusion, and we invite them to see who can provide the most business value for their investment."